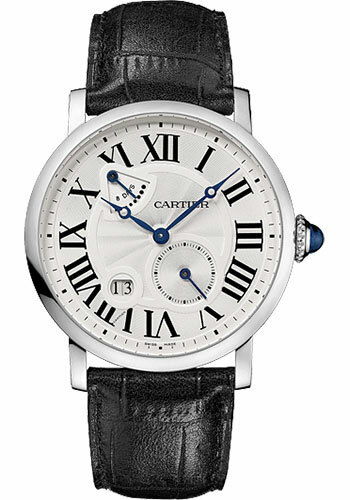 42mm 18K white gold case, circular-grained crown with set with a sapphire cabochon, silver dial with 12 Roman numerals, manual winding caliber 9910 MC movement with small seconds at 5 o'clock and large date at 7 o'clock, approximately 8 days of power reserve, alligator strap with double adjustable folding buckle. Water resistant to 30 meters. 42mm 18K pink gold case, circular-grained crown with set with a sapphire cabochon, silver dial with 12 Roman numerals, manual winding caliber 9910 MC movement with small seconds at 5 o'clock and large date at 7 o'clock, approximately 8 days of power reserve, alligator strap with double adjustable folding buckle. Water resistant to 30 meters.